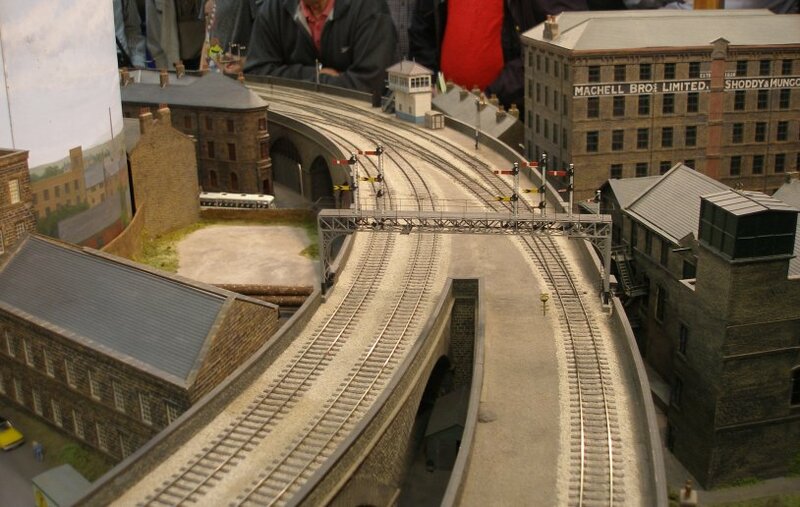 The Manchester Model Railway Society (MMRS) had an enormous influence on my early railway modelling, I attended my first of their shows in 1966. 'Dewsbury' was inspirational in many ways. 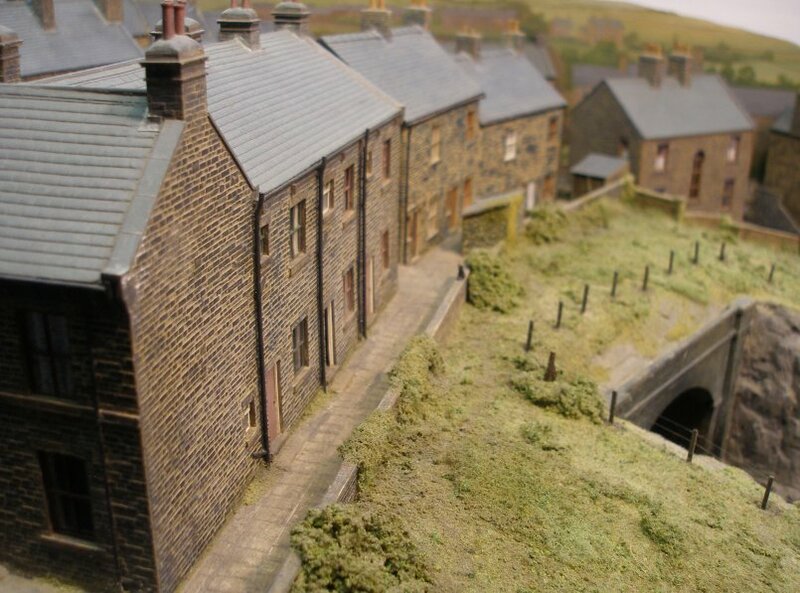 Not only does in depict a typical secondary main line in West Yorkshire in the period 1950 - 1980, with most of the rail infrastructure in place, but it features a large number of well-built structures convincingly grouped around the railway. 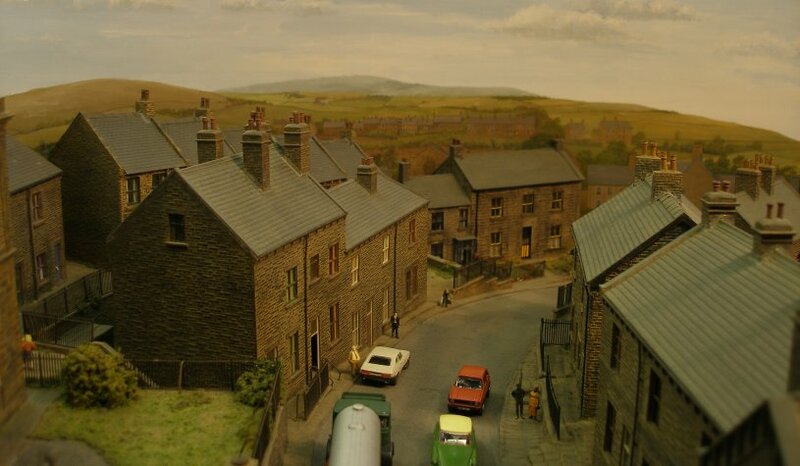 Geoff Taylor's articles on the various buildings he made for 'Dewsbury' have had a direct influence on my own structures. 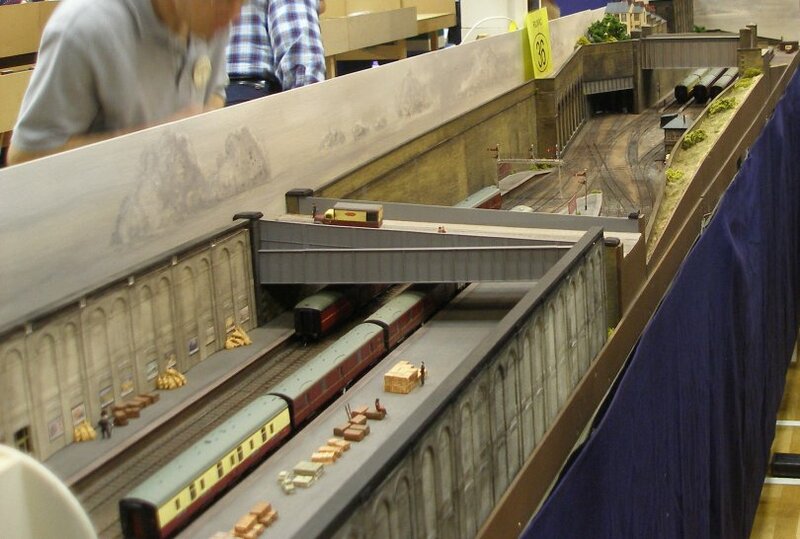 Here are offered a selection of photos of the layout as seen on 24 May 2014 at the Stoke Manderville Leisure Centre in Aylesbury. 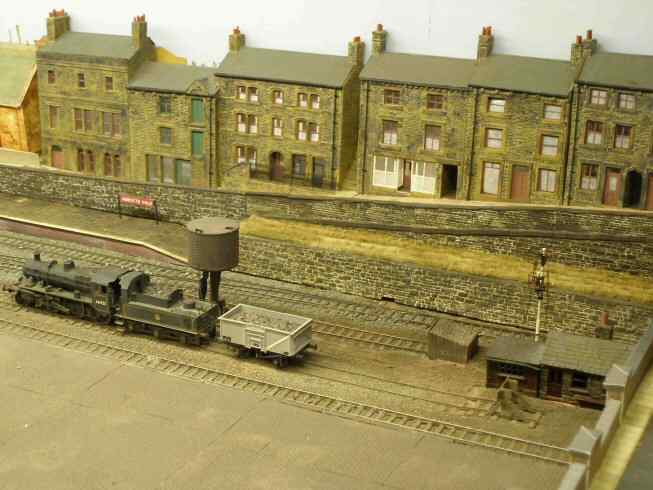 A feature not seen before is the signal box and Midland Railway Asbestos Lamp Hut that have now appeared at the Bradforf end of the layout. The signal gantry is a delight but appears to be non-working. The working catch trap on the down loop; a feature often omitted from more refined P4 layouts. 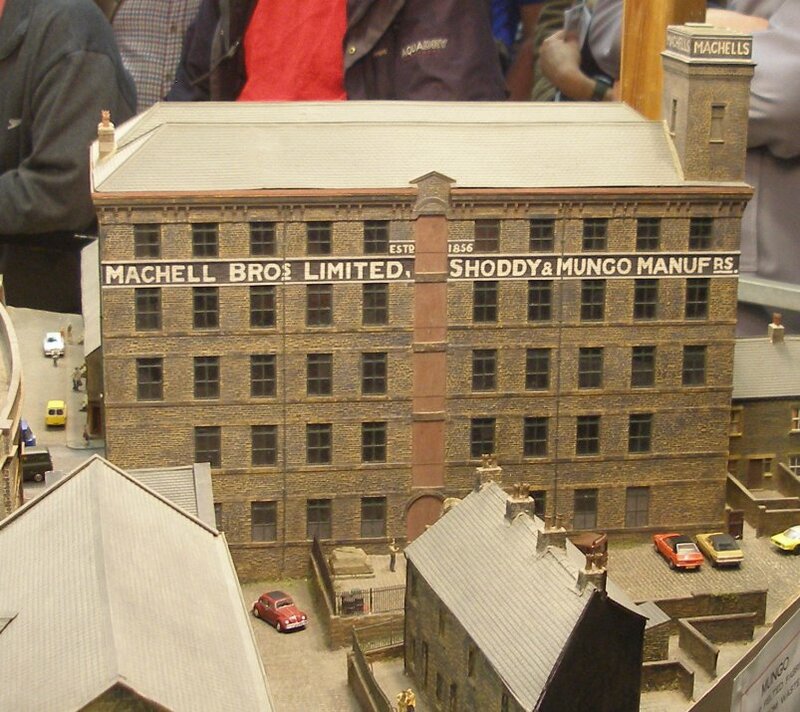 A delightfully observed mill-style building once so typical across the region. Geoff Taylor's Chapel, the construction of which was dealt with in the 'Model Railway Journal'. Looking down the road below the chapel. 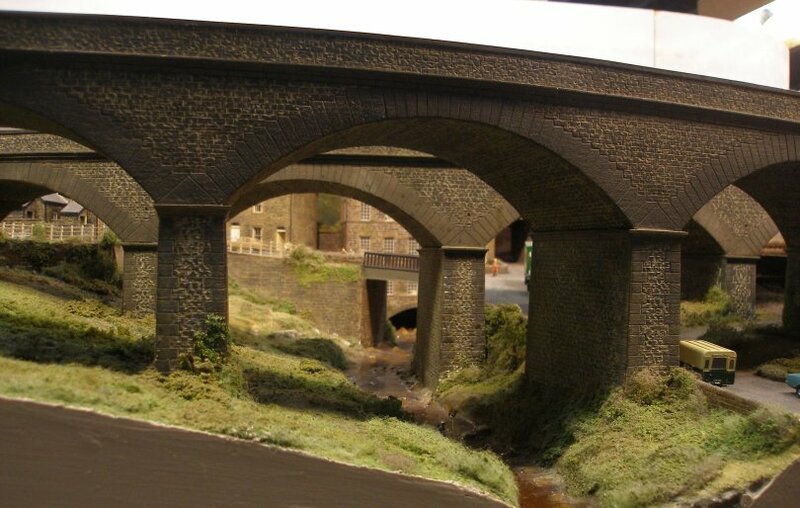 A view showing the two viaducts arching over the small river: shades of Todmorden! 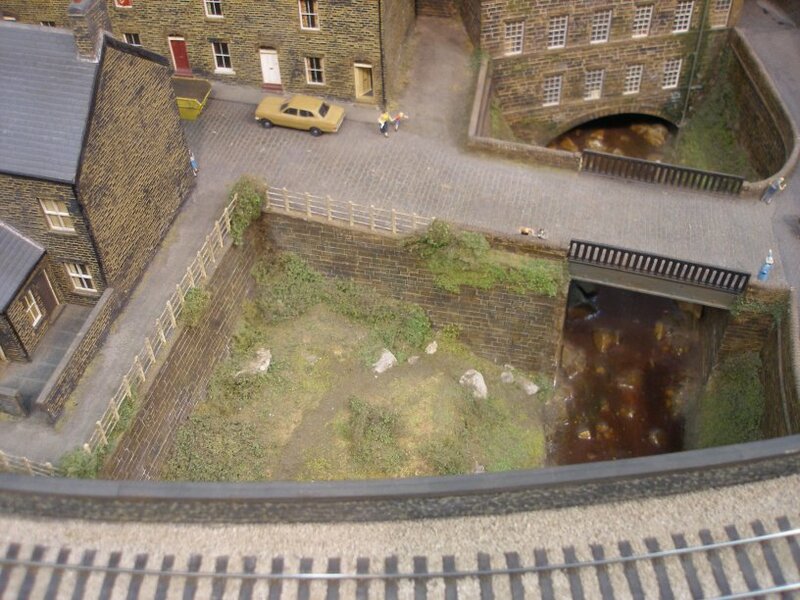 View showing how the river leaves the layout under an adjacent factory. The viaducts seen from above. 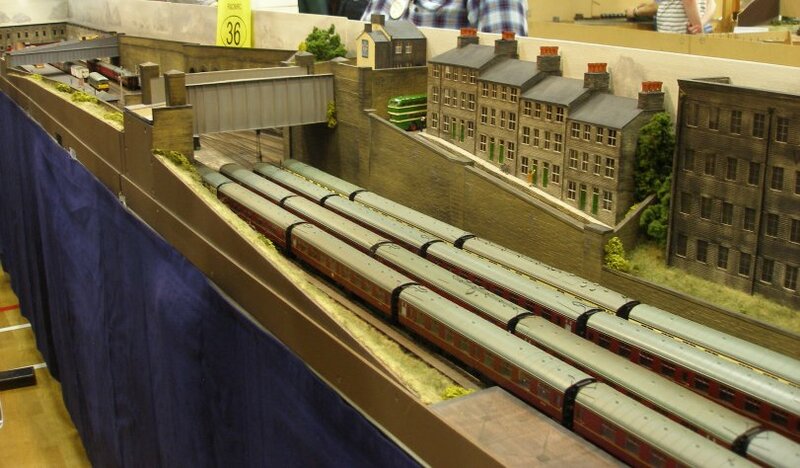 The down sidings contain a typical selection of blue-period stock - the water tank stills holds water, so reflecting the range of periods the layout can represent. Buildings in the foreground are often ignored as viewers try to get a better view of the action in the down loop. The island station building is a very typical feature in this part of Yorkshire. 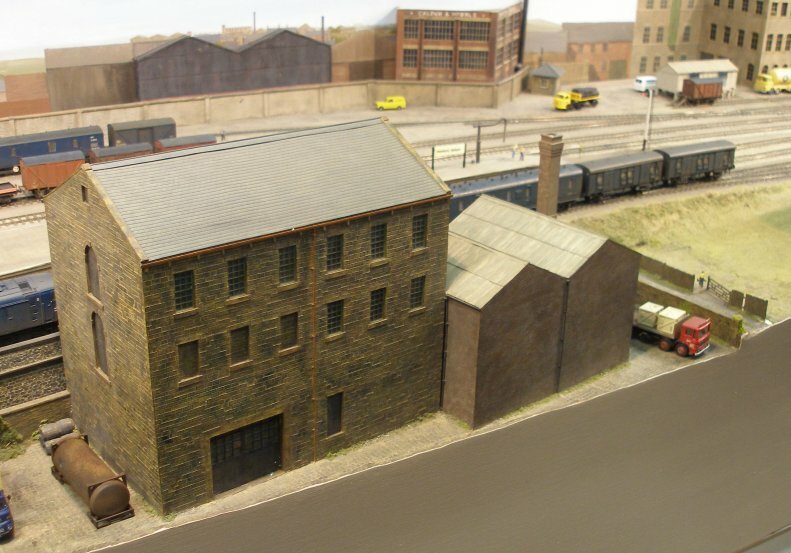 The Goods Shed is, of course, based on Haworth on the now preserved Keighley and Worth Valley Railway. 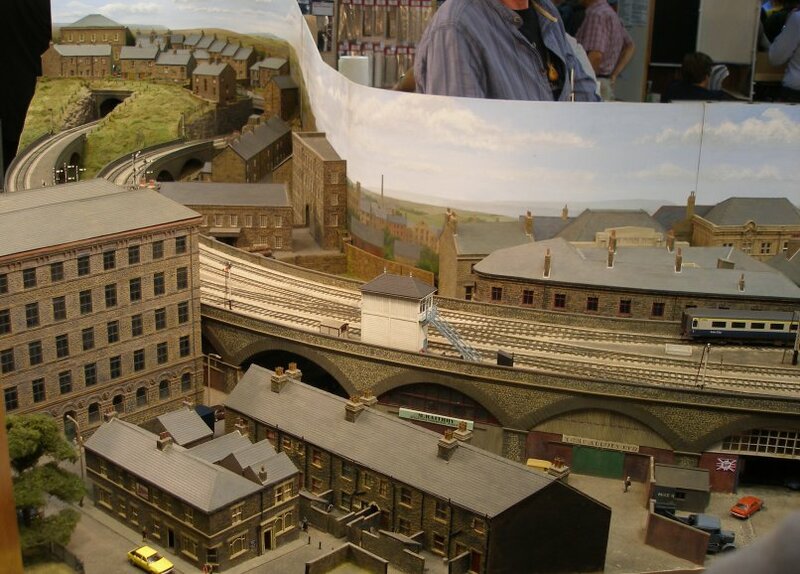 I have a model of this shed and its surprisingly large. 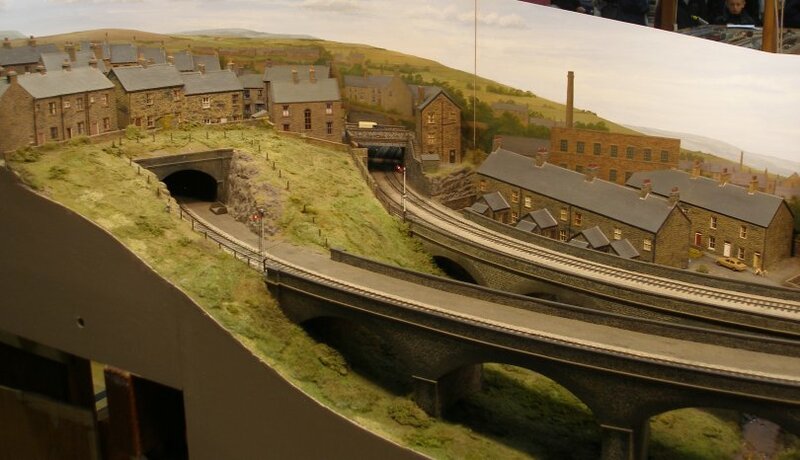 The fact it seems modest in the context of Dewsbury is a reminder of the size of the layout. 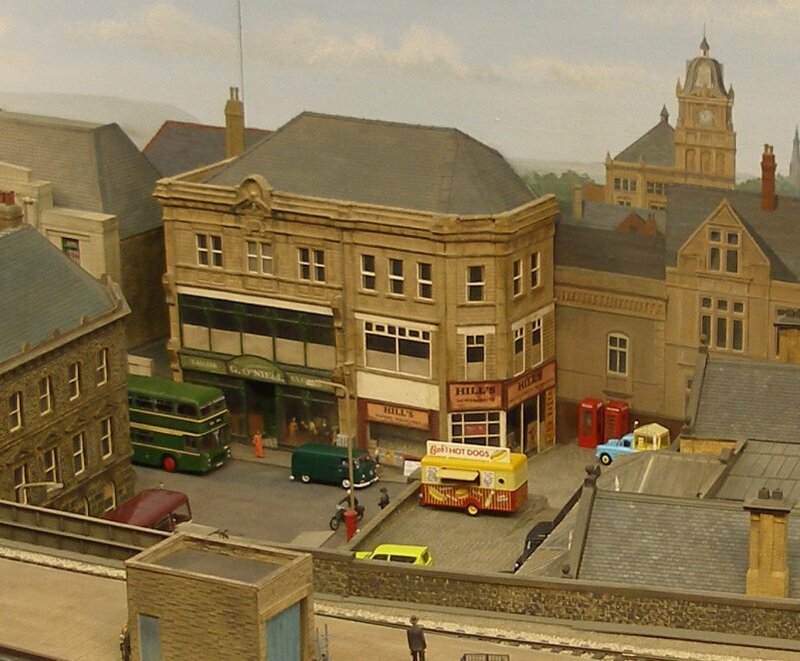 Detail shot of the main street by the station entrance. Love the Morris Minor Panda Car about to enter the 'road tunnel' under the railway. The signal box is a relatively recent addition, as is the accompanying asbestos lamp hut. As far as is known, none of these have made it into preservation, and it is very unlikely any have survived on Network Rail. 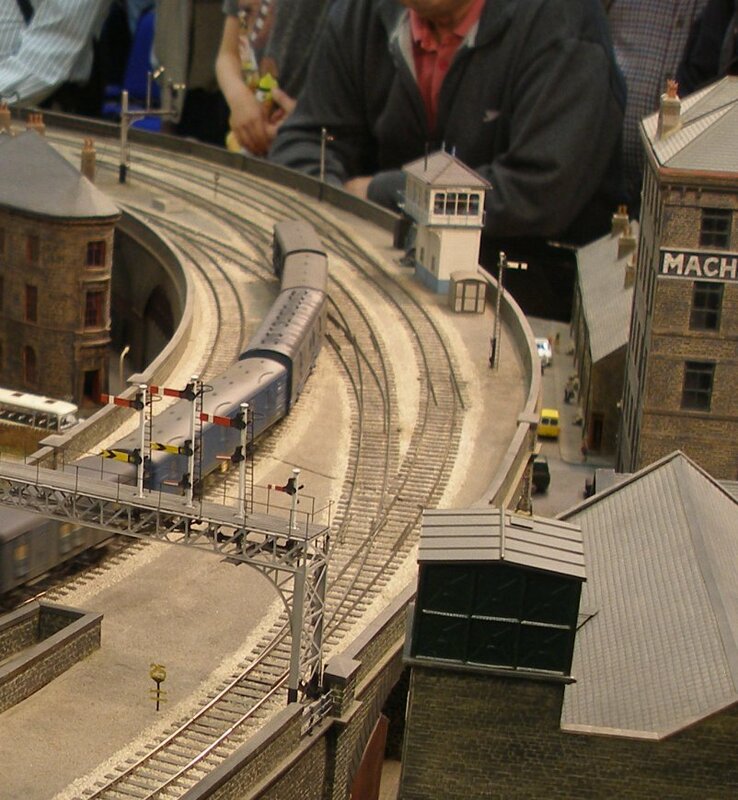 The structures at the Up-end (London) of the layout are based on prototypes across the region. 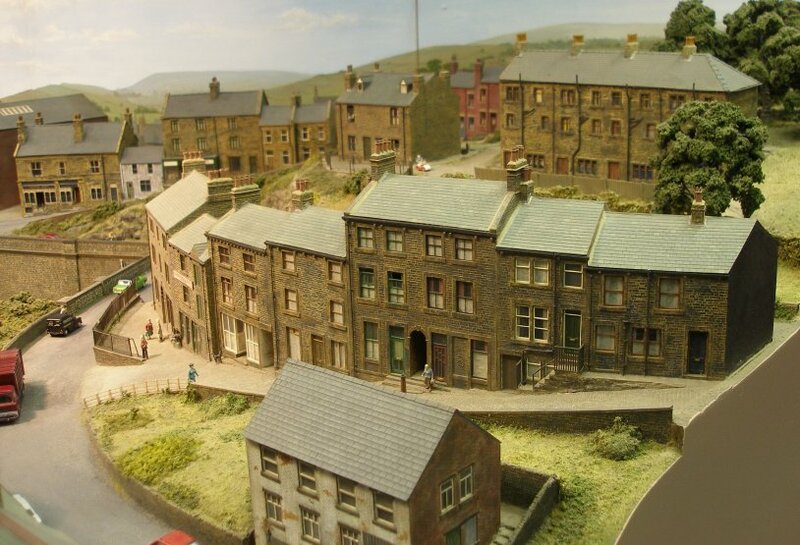 This is a classic set of houses based on a street in Holmfirth and beautifully executed by Geoff Taylor. The construction of these were written up in the 'Model Railway Journal' and I created my own version to try out Geoff's techniques. Imitation is the sincerest form of flattery, so they say! These are my version of the Holmfirth houses. Geoff definitely has the edge, but they were great fun to build. Must be early morning at Bradfield Gloucester Square as the carriage sidings are full. 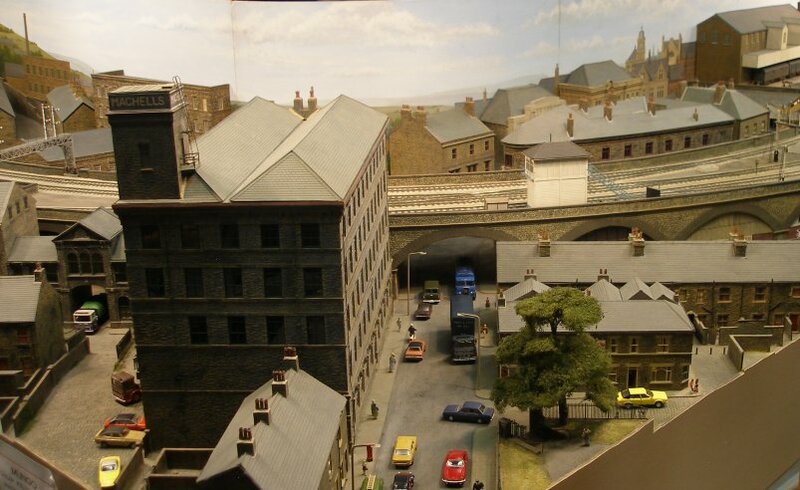 Although the train consists only run to 5 vehicles, it is enough to convey the character and atmosphere of this small City terminus based on Bradford Forster Square. The overall roof had been removed for the show. Bradfield Gloucester Square looking towards Shipley, Carlisle and London.